Scrapbooking With Tina: Our newest "How-To" Book by Jeanette Lynton: WISHES! 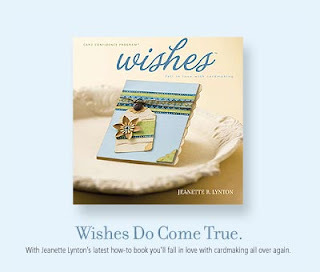 Our newest "How-To" Book by Jeanette Lynton: WISHES! I am so happy to announce our newest How To Program book by Jeanette. It is a card-making program called "Wishes". It is awesome! If you are ever stumped on what to make, feel creatively blocked, color challenged or rushed for time, this book WILL HELP YOU! I love it. Be sure and order yours today. You won't regret it.